Last week, when the Norwegians awarded the 2012 Nobel Peace Prize to the European Union, I think more than a few people were waiting for somebody to grab the microphone and say “Live from New York, it’s Saturday Night.” Strangely enough, nobody did, the Norwegians carried on (with a straight face) and everybody, outside of a couple of thousand apparatchiks in Brussels, went “WTF?” Of all the odd Nobel Peace Prizes ever awarded (and there’ve been a few) this certainly isn’t the oddest (more about that later) but one does begin to wonder who thinks this stuff up in the first place. Do they ask for suggestions? Take a vote? Hold a lottery? My guess is a bunch of ex-politicos get together, toss back a few Hansas, then, as the evening wears on … well, you know the rest. Regardless, the EU is now officially a Nobel Laureate! This entitles them to a diploma and a monetary prize of about ten million Swedish Kroner (Interestingly, neither Norway nor Sweden actual uses the Euro.) I’m sure the Greeks could use the extra cash, though, even if they do have to pay exchange. This isn’t the first LMAO moment for the Nobel Committee; their history is full of them. 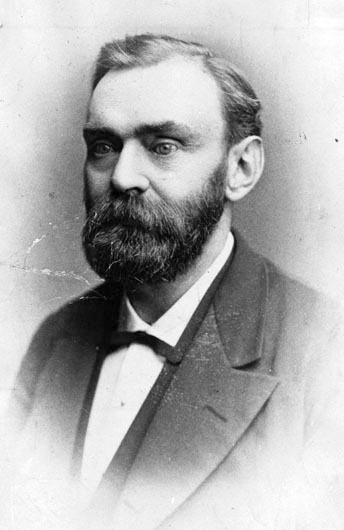 In 1911, the prize was awarded to Alfred Fried, the founder of the German Peace Movement. The idea obviously didn’t catch on, because three years later, German Pickelhaubes were lunging over their borders at anybody who looked at them cross-eyed, and half the world went to war. Fried went to Switzerland (perhaps for the skiing.) When World War I was over, Nobel got busy again, and in 1919, awarded the Peace Prize to Woodrow Wilson for his work on the League of Nations. The best that can be said about Wilson and his “Fourteen Points” is God only had ten. Meanwhile, the League was such a winner that Wilson couldn’t even convince his own country to join it. Ten years later, in 1929, the Prize was given to Frank Kellogg (no relation to the Corn Flakes guy) who, with Aristide Briand, produced the Kellogg Briand Pact which outlawed war. Unfortunately, no one bothered to tell the fascists this, and they spent the better part of the next decade killing people. Finally, a couple of guys (Chamberlain and Daladier) said enough is enough and started shooting back. For the next six years, the entire world set about slaughtering each other as if they were born to it. The bloodbath ended only when President Truman (who never got a Peace Prize, BTW) scared the bejesus out of everybody with the world’s first atomic bomb. For the next twenty years, the Nobel Committee didn’t have that much to do. Most of the awards were no brainers: Marshall, Pearson and the Red Cross, etc. etc. It wasn’t until the highly politicized Vietnam War came along that Nobel went back into full idiot mode. In 1973, they awarded the Peace Prize to Henry the K (Kissinger) and Le Duc Tho, his Vietnamese counterpart. There are people walking around today who still think Henry should be tried for war crimes, and given the Vietnamese penchant for murder, mayhem and torture, the only nice thing people have ever said about Le Duc Tho is he had the good grace to refuse the award. In 1994, Shimon Peres and Yitzhak Rabin shared the Peace Prize with Yasser Arafat. Two ex-military Israelis and the grandfather of international terrorism! I’m sure Mars and all his minions closed up shop and retired. From there, is just got nutsy. In 2001, it was Kofi Annan to the podium. This is the guy who handled the UN peace keeping forces in Rwanda in 1994 — not that there were any. He was instrumental in the debacle that George Clooney had to clean up in Darfur. He was running the show while the North Koreans were developing nuclear weapons and may or may not have been up to his elbows in the Oil-for-Food scandal. Not only that, but many people believe he single-handedly ruined the United Nations for all future generations. The next year, 2002, the Nobel Committee decided it was Jimmy Carter’s turn to get a basketful of Kroner. If you recall, it was Jimmy who screwed up the 1979 Islamic Revolution in Iran so badly that relations between Iran and the West have been in the toilet ever since. In fact, the results of Jimmy’s utter incompetence turned Iran into the maverick state we’re faced with today and have put the entire world at risk of war for thirty years. However, it’s recent history that says it all. In 2007, the Nobel Peace Prize Committee telephoned Al Gore and said, “Come on down!” Al, the king of global warming, flew in with one of the biggest entourages in Nobel history, including his own motorcade. Meanwhile, celebrities of every stripe were also flying in from all over the planet to attend the After-Award parties that guzzled and gossiped into the night. It was the inauguration ball that Al never had. Enough jet fuel was expended in one week to power Las Vegas on the 3rd of August. Then, as the limos idled outside, Al told the assembled few that if ordinary people didn’t quit using up the planet’s resources, we were all going to be up to our elbows in poached polar bears. After that, they all climbed into their jets and went home, happy in the thought that the planet was a better place for their having been there. However, for downright slap-you-in-the-face audacity, nothing beats Barack Obama’s getting the Nobel Peace Prize in 2009. There isn’t a single reason why he should have been chosen. His contribution to the world up to that point was nothing short of nothing. He hadn’t done a damn thing for peace except talk about it. College sophomores do that every day. Who did the Committee reject? A bunch of crack addicts? At the time, Barack said he was surprised; he should have been embarrassed. However, he stood up there, like Al and Jimmy and Kofi before him and got his diploma — just like everybody else. 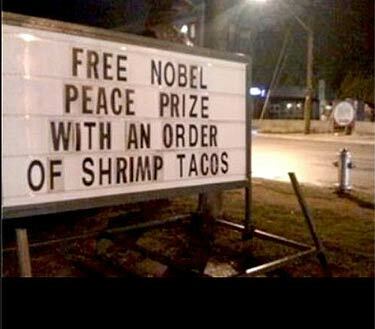 However, as I mentioned, even Obama’s peace prize isn’t the oddest one. 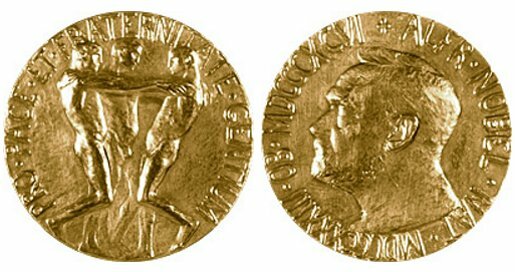 The oddest Nobel Peace Prize ever was the one the Nobel Committee never awarded. For some unknown reason, the Nobel Prize for Peace was never given to Mohandas K. Gandhi. This entry was posted on October 15, 2012 by wdfyfe in History and tagged European Union, Nobel Committee, Nobel Peace Prize, Nobel Peace Prize Committee.